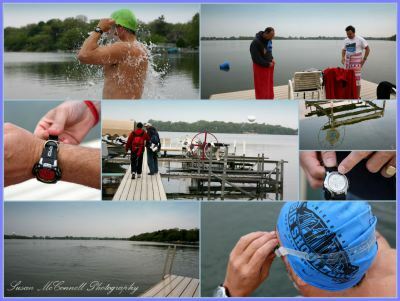 Got up early this morning and followed Doug and his training partner, Don Macdonald, to Lake Zurich for the first swim of the season. The air temp was 63.2. The water temp was 60.6. They kidded around as they each started their getting ready rituals. I had no idea they stripped down naked and put their suits on right there at the dock. Caught off guard … no pictures of that. Don Macdonald ceremoniously fills his swimming cap with water, sits it on top of his head, and then inverts it, letting the water crash down on him as he eases the cap on. Doug fusses with his cap and goggles and snaps them a lot. One thing I’ve noticed is that every open water swimmer, when they’re of the married sort, does something interesting with their wedding bands when they head out. Doug puts his in his shoe. Don puts his on his watch band. One time I saw a guy hand his to his little girl and she held it tight in her hand the whole time he was gone. Anyway, on this morning, they eventually jumped in, waived at me and swam off into the distance. I got back into my car and quietly turned up the heat. Note: The whole collection of photographs may be seen on My Bionic Boyfriend’s facebook page.